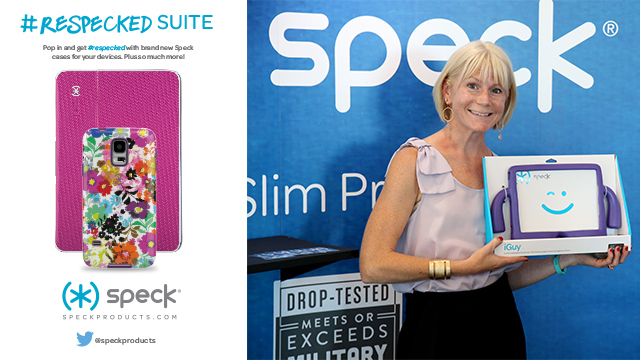 Last week Speck teamed up with our friends at Stella & Dot and Tina Case Photography to host a #ReSpecked suite where we got to show off our latest in mighty slim protective designs to some our favorite bloggers. We shared our latest ShowFolio for iPad mini + mini with Retina display – the perfect companion for long road trips or antsy backseat passengers – along with a slew of other favorites like CandyShell Card for iPhone 5s/5, DuraFolio for iPad Air, and CandyShell Inked for Samsung Galaxy S5. Tina Case Photography snapped complimentary head shots of our visitors for their blogs and social profiles, while Stella & Dot put on a trunk show, selling their most popular, colorful, and stylish jewelry designs. See highlights on our Facebook page and contact us at press@speckproducts.com to get yourself on the next event’s list!